While it’s useful to forecast propagation conditions, it’s even more useful to know what the actual propagation conditions are. Propagation forecasting is somewhat like weather forecasting, although slightly less accurate. I wanted to measure (and store for future reference) the signal levels from several shortwave stations from various parts of the world, transmitting on a range of frequencies. These stations can act as references for determining what propagation conditions are like to that part of the world, on a certain frequency or band, anyway. One way to do this would be to step a radio through a list of frequencies, measuring the signal level and recording it. The problem is that you need to sit on a given frequency for at least some short period of time, to measure the signal level. And, if you’re only on the frequency for a second or two, that recorded signal level may not be characteristic of the actual signal level. You could have been monitoring while there was a burst of interference, causing a false high signal level reading. Or during a sudden deep fade, causing a weaker signal. And the longer you sit on one frequency, the less time you’re spending on other frequencies. You’re not continuously monitoring, but taking short snapshots. But there is a solution. Once again, SDR (Software Defined Radio) to the rescue! 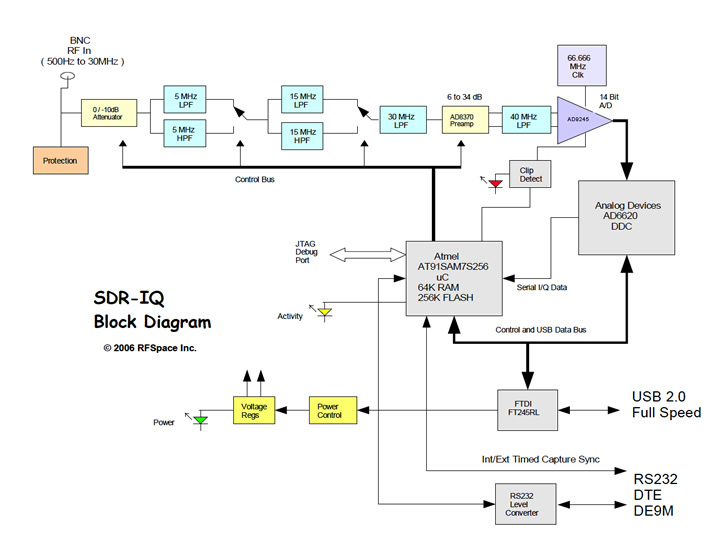 In this setup, an RF Space SDR-14 Software Defined Radio is connected to a 132 ft T2FD (Tilted Terminated Folded Dipole) antenna. Custom software is continuously reading A/D (Analog to Digital Converter) values from the SDR-14 (in real, not complex, mode). The A/D sample rate is approximately 66.67 MHz. Blocks of 262,144 readings are taken, and an FFT is performed. The result is an array of signal strength readings for the entire HF spectrum, 0 to 30 MHz, in 254 Hz steps. You will get a list of frequencies, with a brief description of the station on that frequency. 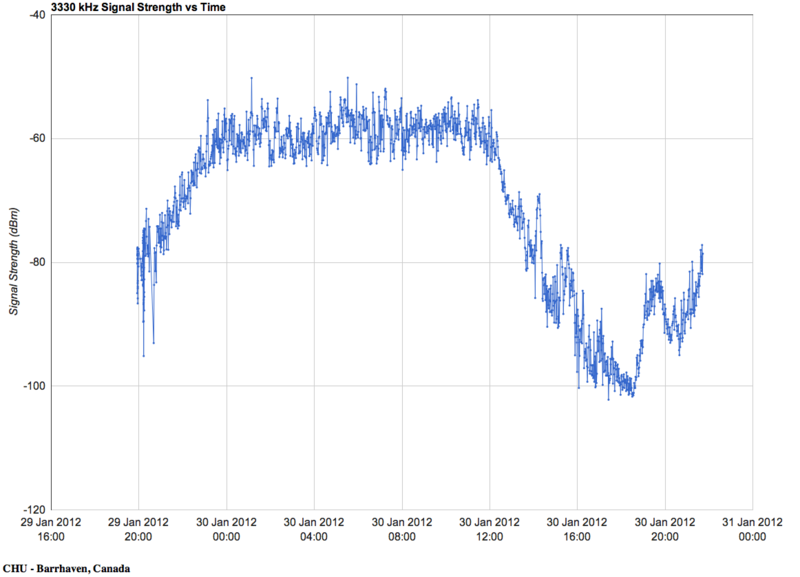 Click on a frequency to get a graph of about three days worth of signal readings. 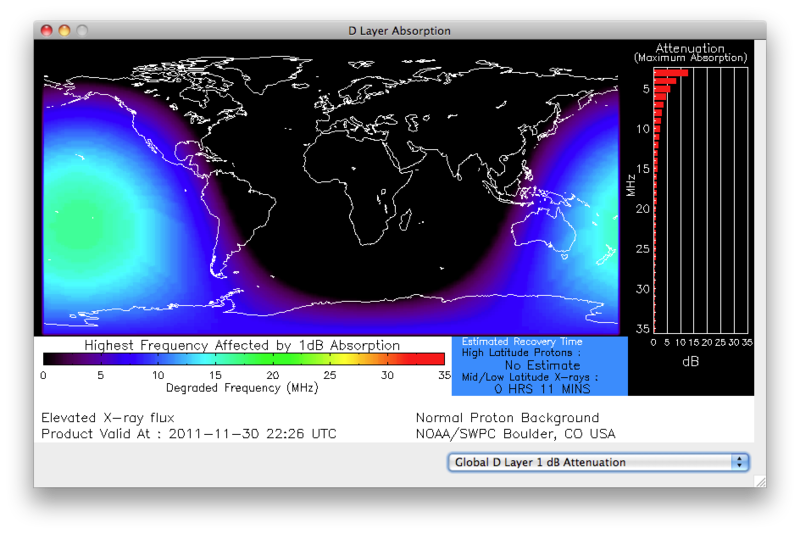 For the lower HF frequencies, signal levels are very weak during the daytime, due to absorption by the D layer. They then slowly rise as the Sun sets, stay high overnight, and then go back down again as the Sun rises. For higher frequencies, say 6 and 7 MHz stations operating in NVIS mode such as NAA on 6726 kHz, you can see a sudden decrease in the signal level as the station goes long in the evening, and then an increase again when the Sun rises, and the F layer increases in strength. The signal does not always completely go away during the night, but it is significantly weaker. There are also periods at night when the signal level goes up and down. This could be the actual signal from the intended station, or possibly another station located elsewhere in the world. The effect is much more pronounced for even higher frequencies, such as WWV on 20 MHz. The recording for 10 MHz often shows WWV cutting out around local midnight, then the signal level goes back up again in the early morning, but before sunrise. 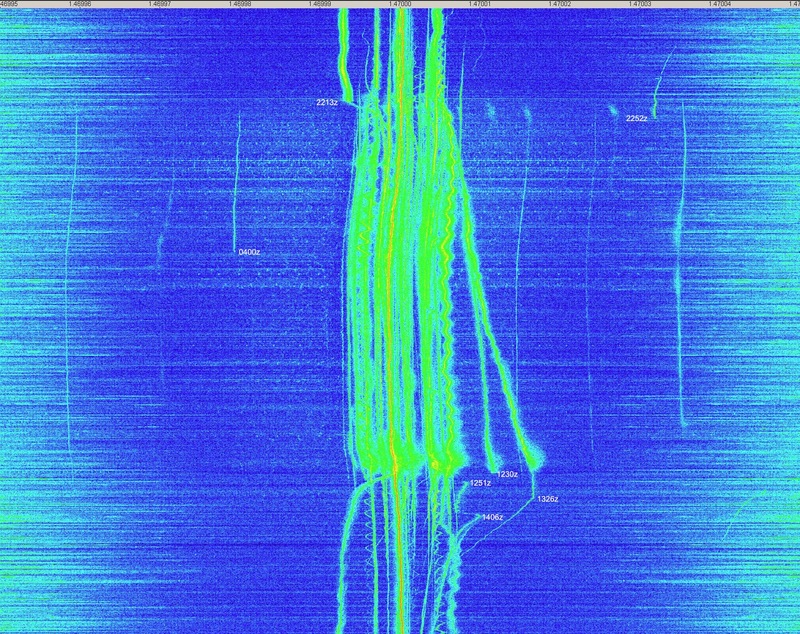 I believe in this case we’re actually getting a signal from WWVH in Hawaii. I’m also recording 25,555 kHz, which is a mostly open channel. My goal is to observe radio noise from Jupiter on this frequency. The aviation weather frequencies (6604 kHz for example) do not have continuous transmissions, there are gaps. This is readily observable by seeing the steps in signal level. You will often see spikes in the graphs. 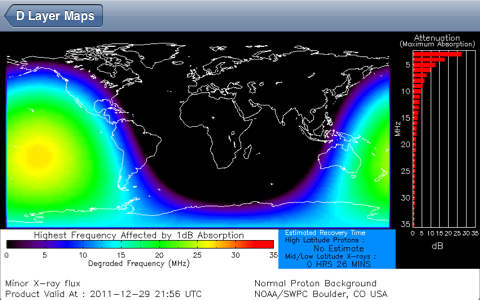 This is mostly likely due to local noise, it could also be to brief transmissions on the frequency. There are ionospheric sounders that sweep across HF, as these pass by the frequencies being observed, they will cause a brief increase in the measured signal level. 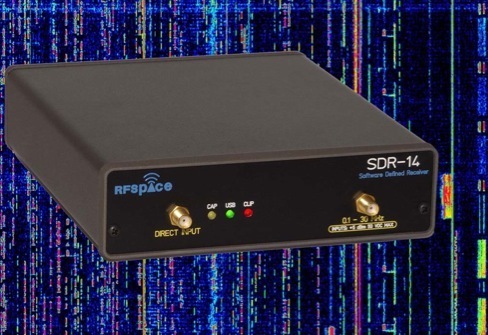 You may also notice occasional gaps in data, the ancient computer the SDR-14 is running on (under Windows 2000) seems to develop USB issues every dozen or so hours. I need to try to set it up on another computer and see if that helps. Worst case I may try to rig up some sort of a Watchdog Timer. As mentioned during the introduction, these graphs can be very useful in determining what time of the day propagation is open to various parts of the world on certain bands. It is important to remember that much like the weather, propagation changes from day to day, and with the seasons. The levels of solar activity, as well as the effects of solar flares, have a dramatic effect on propagation. Changes in the season affect the number of hours per day of sunlight on the ionosphere over the different parts of the Earth, and cause seasonal changes to propagation patterns. Do you have a suggestion for a frequency to monitor? Ideally, the frequency should have a station that is on 24 hours a day. If so, please pass it along! 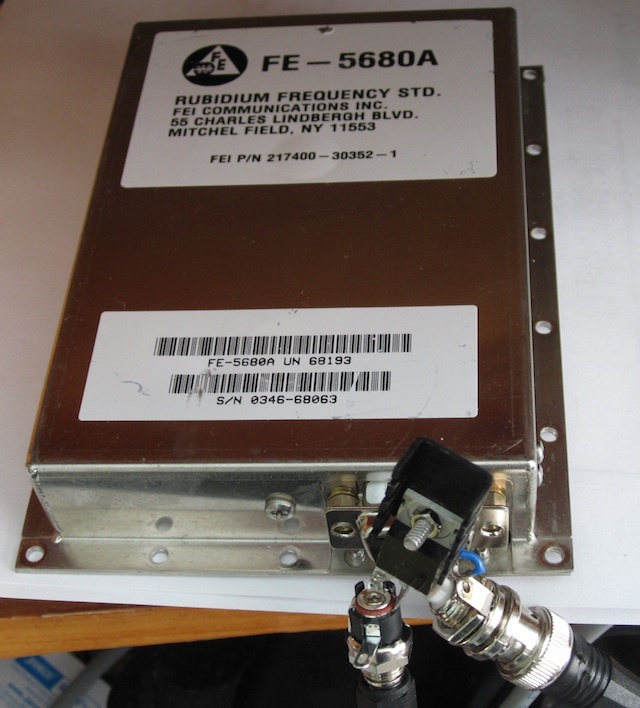 I recently acquired a FE-5680 rubidium frequency reference off eBay. This is a high stability 10 MHz frequency reference. 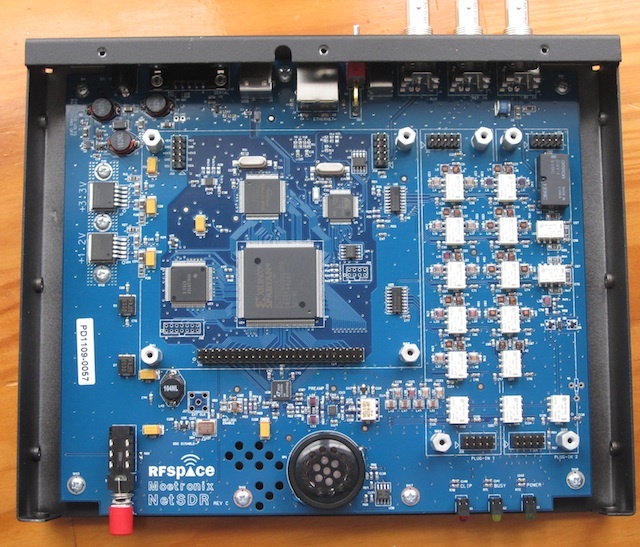 I also bought the REFCLOCK option for the netSDR directly from RF-Space, which takes the 10 MHz as a reference input, and produces an 80 MHz clock for the A/D, locked to the reference input. The result is less drift in the radio. The stock netSDR drift is already extremely low, but I want to do some observations of RF carriers over a long time period, so I wanted to reduce the drift even further. Here’s a picture of the reference I bought, it was around $55 shipped, from China of course. The reference requires 16V at just under 2A peak, as well as 5V at a lower current. I used an old laptop power supply, and rigged a 7805 to produce the 5V. Unfortunately all input and output is via a DB-9 connector. The 16V is applied via the barrel connector on the left, and the 10 MHz comes out the BNC on the right. I’ll post some followup articles with long term waterfalls, and we’ll see how the drift looks. The Rubidium Physics Package incorporates a rubidium cell, rubidium lamp, and servo electronics to utilize the ground-state hyperfine transition of the rubidium atom, at approximately 6.834x GHz.The VCXO is locked to the rubidium atomic resonance in the following manner. The VCXO frequency of 50.255x MHz is an exact sub-multiple (36) of the atomic resonance frequency at 6.834x GHz. A microwave signal, having a frequency in the vicinity of 6.834x GHz, is generated from the nominal 50.255x MHz VCXO input. This microwave signal is used to resonate vaporized rubidium atoms within a sealed glass Rb resonance cell that is placed in a low Q microwave cavity. The microwave frequency generation method is designed so that the VCXO frequency is exactly 50.255x MHz when the microwave frequency is exactly equal to 6.834x GHz. The frequency of the signal applied to the microwave cavity can be maintained equal to 6.834x GHz by generating an error signal when the frequency varies, and using this error signal to servo the VCXO via its control voltage. The error signal is generated in the physics package. Light from the rubidium lamp, produced by an excited plasma discharge, is filtered and passed through the rubidium resonance cell where it interacts with rubidium atoms in the vapor. After passing through the resonance cell, this light is incident upon a photocell. When the applied microwave frequency is equal to 6.834x GHz, the rubidium atoms are resonated by the microwave field in the cavity; this causes the light reaching the photocell to decrease. The decrease in light, when the microwave frequency is equal to the sharply defined Rubidium frequency, is then converted electronically to an error signal with phase and amplitude information that is used to steer the VCXO via its control voltage and keep it on frequency at 50.255x MHz. The VCXO operates nominally at 50.255x MHz. The VCXO has two isolated outputs; one output is provided to the Rubidium Physics Package for comparison purposes, and the other output is used as the clock input for direct digital synthesis within the Synthesizer. The recording was made with an SDR-14 set to record a 5 kHz bandwidth (8137 Hz sampling rate) centered on 7850 kHz. This was AM demodulated with the IF filter set to cover 7849.7 to 7852.5 kHz, covering the carrier as well as much of the modulated signal. CHU transmits a carrier and upper side band, with 10 kW of power. 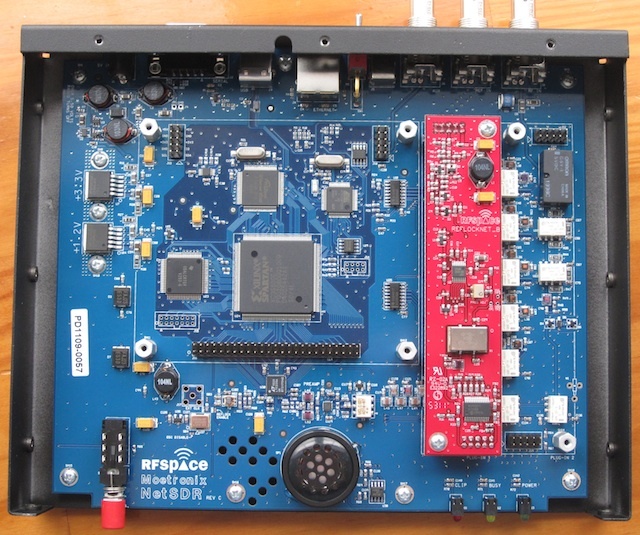 The displayed dBm readings are too high by 24 dB, due to the IF gain setting on the SDR-14. I’ll need to correct for that with future recordings. But the relative changes are valid. At 0114 UTC, the signal suddenly dropped by about 25 dB, this is when the band went long. It then further dropped another 6 dB or so. At 1312 UTC, the signal suddenly came back up, this is when F layer ionization was strong enough again for reception of CHU via NVIS. At 0038 UTC, the signal dropped again when the band went long. Note that this occurred at a different time than the night before. For reference, CHU is about 550 km from my location. The big event on the 19th was the solar flare. It peaked at a level of M3.2, and was a very long duration flare, it stayed at M levels from about 1500 to 1930 UTC. You can see the effects on CHU, the signal dropped about 2 S units (12 dB). The effects on CHU’s 90 meter frequency of 3330 kHz were even more dramatic, I tried tuning in, and it was completely gone. Normally it is S9 or better during the daytime in the winter. The attenuation was due to the x-rays from the flare increasing the ionization of the D layer of the ionosphere. The D layer does not contribute to propagation, rather it attenuates radio waves. So a stronger D layer means weaker signals, and the effect is more pronounced at lower frequencies. You’ll notice a dip in the signal around 2300 UTC on the first day, and a small solar flare about the same time. I believe this is a coincidence, not due to the flare. The decrease in signal is too sudden, and the flare was not that large. I quickly put up a special dipole for this test, and it may have some issues. We had some wind that day, perhaps there was an intermittent contact. While we didn’t have any flares overnight, if we had, there would not have been an affect on the signal, as they only affect the part of the Earth in sunlight, and this path was entirely in the dark side of the Earth. The GOES 15 weather satellite (the one that is in geostationary orbit and provides the animated views of the weather over the US that you often see on the TV news) also has a set of sensors that monitor the Sun. One of these measures the x-ray output. X-ray level measurements consist of a letter and number, such as B6.7, representing the x-ray flux in watts/square meter. It is a log scale, much like what is used for earthquakes. A value of C1.0 is ten times as large as B1.0 (and would be equivalent to B10). Values in the A range are low background levels, such as at solar minimum. B values are a moderate background, and C values are either a high background or solar flare conditions. Flares usually result in short bursts of large x-ray levels, in the C, M, or even X range. Remember that this is a log scale, so an M1 flare is 10 times as energetic as a C1 flare, and an X1 flare is 100 times. There is a new Y classification as well, so a flare that would have been say X28 in the past would now be Y2.8. The x-rays also increase the ionization of the F layer (which is the layer that gives us shortwave propagation), although the effect is less than for the D layer. The net result is that increased x-ray levels cause more attenuation at lower frequencies, but can also lead to better propagation at higher frequencies. 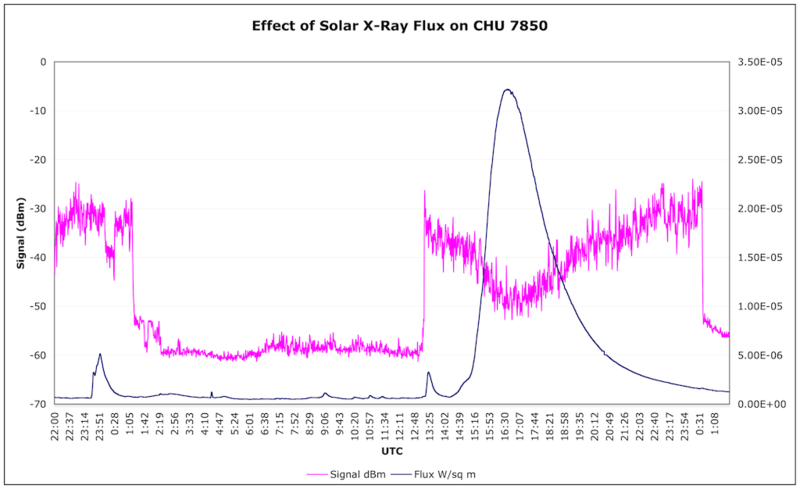 Long periods of high x-ray flux levels (well into the C range) may be a sign of good 10 and 6 meter band conditions. I’ve also found that high (C range) levels seem to “stir the pot” for MW DX, bringing in different stations than usual. Very high flux levels, such as during a major flare (in the high M or X range) however cause radio blackouts. These occur first as lower frequencies, and as the D layer begins to get more ionized higher frequencies are also affected. Extremely energetic flares (X range) can wipe out all of HF. Note that this is only true for propagation paths on the sunlight side of the Earth. The dark side is not affected. This means that flares can be useful at times, in that they can cause the fadeout of an interfering dominant station on a particular frequency, allowing another station to be heard, providing the geometry of the Earth and Sun are correct such that the path of the interfering station is in the sunlit part of the Earth, while the other station is not. Solar flares are usually of a short duration, minutes to an hour, although there are “long duration events” that can last for several hours. If you notice suddenly poor conditions, you may want to check the current x-ray flux levels, to see if a flare is the cause. If so, try higher frequencies, as they are less affected. DX Toolbox also has several propagation prediction windows, to help estimate signal levels for any path you enter, based on solar conditions. I thought it would be interesting to see whether or not it was possible to crudely measure the speed of light using a shortwave radio and a time station. Various time stations transmit precise time on several shortwave frequencies. Here in the USA, we have WWV in Ft. Collins, Colorado, which transmits on 2.5, 5, 10, 15, and 20 MHz. We also have WWVH in Kekaha, Hawaii, which transmits on 2.5, 5, 10, and 15 MHz. These stations transmit an audio “tick” at exactly each UTC second. One way to measure the speed of radio waves (and light) would be to measure how long it takes for the tick to travel a fixed distance. Divide the distance by the time, and we have the speed of light. However, that requires knowing the exact UTC time locally. While this can be done with a GPS unit that outputs a 1 PPS (pulse per second) signal, I thought it would be more interesting to do it using just a shortwave radio without any extra hardware, other than a computer to record the audio. You can hear the time announcement for WWVH first, by a woman, followed by a man giving the WWV time announcement. I am roughly at a location of 77W and 40N. WWV is located at roughly 105W and 41N, and is about 2,372 km away. WWVH is located at roughly 160W and 22N, about 7,883 km away. The actual path the radio waves takes to reach me is longer, due to the fact that they reflect off the ionosphere, a few hundred km high. We’ll neglect that for now. The difference in distance between WWV and WWVH is 7883 – 2372 = 5510 km. 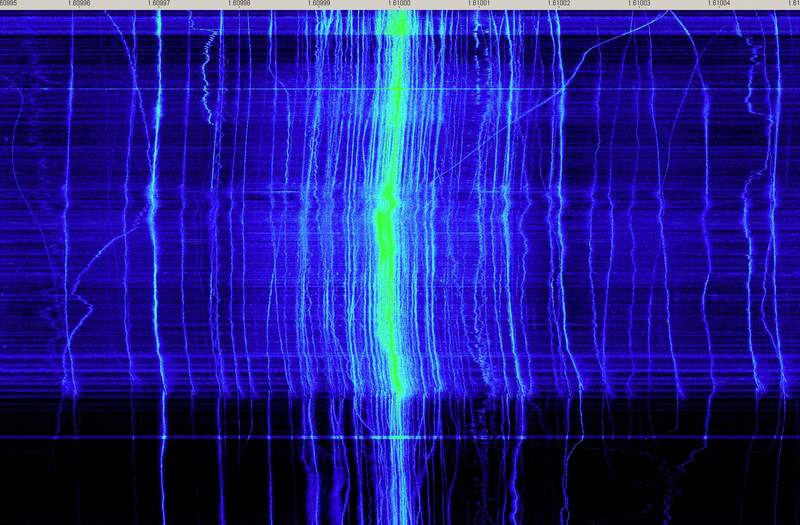 The other waveforms you see before and after the second ticks are the audio that each station always transmits. If we subtract the time markers for the two ticks, we get 19.105 – 19.086 = 0.019 seconds (19 milliseconds). That’s the time delay between the two ticks. Next, performing our division, 5510 km / 0.019 seconds = 290,000 km/second. The generally accepted value for the speed of light is 299,792 km/second. That’s pretty close! In all fairness, the time resolution is not that good, and I had to eyeball the readings. Plus, a one millisecond difference in the time delay would have resulted in about a 15,000 km/sec difference in the speed of light. So a slight difference in eyeballing these broad time ticks would result in a large error in our estimate of the speed of light. If you listened carefully to the recording, you no doubt heard a fluttery or watery quality to the sound. This is often indicative of multipath, where the radio waves take two (or more) paths between the transmitter and receiver. In this case, we can clearly see the second tick from WWVH. But there’s no second tick from WWVH, just silence. Where is it? Looking further into the recording, we see another second tick delayed much further. Eyeballing it, the delayed tick is at about 27.187 seconds into the recording. And the first tick, which we believe is from WWV is at about 27.087 seconds. The difference between the two is 0.100 seconds. Using the accepted speed of light, this difference in time could be due to a distance of 299,792 km/sec * 0.100 sec = 29,972 km. What could account for this delay? One possibility is that during this time period, the signal from WWVH was not taking the normal or short path to my location, but was instead travelling around the other side of the Earth, taking the long path. The circumference of the Earth is about 40,075 km (the exact value depends on which path around the Earth you take, as the Earth is not a perfect sphere). We know the short path is 7,883 km, so the long path is about 40075 – 7883 = 32192 km. 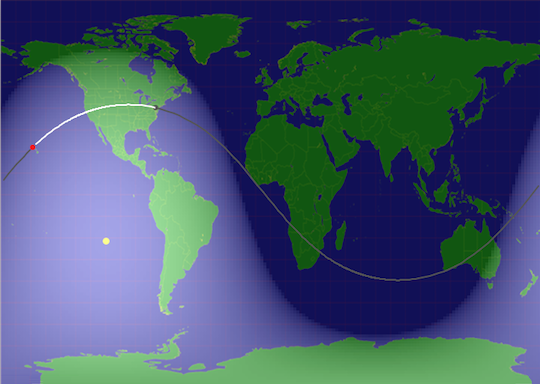 There is still the delay due to the time it takes the radio waves to get from WWV to my location, that path is 2,372 km. The net difference between the two is 32192 – 2372= 29820 km. We can divide that distance by the speed of light to see what the time delay should be: 29820 km / 299792 km/sec = 0.099 seconds. This is extremely close to our measured period of 0.100 seconds, and suggests that the long delayed second tick really is from the WWVH signal taking the long path around the Earth to reach us.